The K9 officer-type dog that attacked and nearly killed an 85-year-old woman and a 64-year-old man belonged to a Grover Beach policeman, according to San Luis Obispo County Animal Services. Authorities have not identified the officer or stated whether he could face any charges or disciplinary measures. The victims of the dog attack remain in the hospital with serious injuries. The Belgian Malinois was a personal pet of the Grover Beach officer, and was not a city-owned animal, according to a press release issued by Animal Services. Around 1:15 p.m. on Tuesday, Grover Beach police officers and Five Cities Fire Authority personnel responded to reports of a dog attack in the 1100 block of Nacimiento Road. Responders found two dogs running at large and two victims who were suffering from serious injuries. One of the dogs was a 2-year-old Belgian Malinois. The second dog was a German Shepherd that also belonged to the Grover Beach officer. 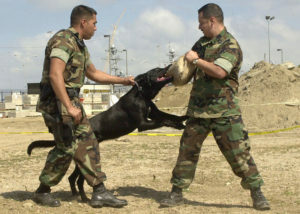 Responders determined the Belgian Malinois was the more aggressive dog. Medical personnel arrived, provided care at the scene and transported both victims to the hospital. David Fear, 64, lost six pints of blood as a result of the attack. The dog bites severed two arteries in his arm, and Fear developed an infection from the bites. KSBY reports Fear has been put on dialysis because his kidneys were failing and he was suffering liver issues. Fear remains in critical condition, but his condition is said to be improving. Fear is being described as a hero who possibly saved the life of his neighbor, Betty Long, 85, who suffered a broken pelvis, broken shoulder and head wounds during the attack. Long is currently in fair condition. An Animal Services investigation is ongoing. The Grover Beach officer who owned the dogs is cooperating with investigators, according to the agency. The officer turned over the Belgian Malinois to authorities, and the dog has already been euthanized. The dog was also tested for rabies. The Grover Beach Police Department is assisting with the Animal Services investigation, but is not the lead agency due to protocol for dog bite cases. Grover Beach police are not commenting on the incident and are referring all questions to Animal Services. Set a maximum number of dogs that could be owned by one person. Set a maximum weight for those dogs that are allowed. Dogs would be required to be muzzled (even at home) unless they were eating or in use by law enforcement. Dogs would always need to be on-leash or tethered — even at home. Dogs could not be brought out into public without a special, expensive and very difficult to get license. Dogs would not be allowed around kids in places like schools and gov’t buildings. A special license would be needed to even buy a dog. This license would include a background check of the licensee. Another license/permit would be required whenever someone bought a new dog in addition to the above. No one could sell or give away a dog unless they did so with a certificate from a licensed veterinarian. This issue of dangerous dogs has been with our society for a long time. The debate has usually been dominated by pit bulls, probably the most dangerous breed since they are so common. Anyway, I’ll be on the Dave Congalton show (am 920 KVEC radio) on Monday at 5 pm to discuss this in as much depth as we can. I have many personal experiences in this arena and hope I can share them with the listeners. And here is a juicy tidbit. Just minutes ago I saw a woman walking her dog on leash; the dog decided to investigate something by the side of the road and jerked the leash right out of her hand. It took two of us to capture her otherwise nice dog. Not a lot of safety in leashes unless the human is constantly vigilant which they rarely are. No! He died ? Terrible and inexcusable tragedy.I cry for the victim from afar.I an reading this from another state far away. Does not make hearing of thus any easier. I agree. This thread has gotten off topic. The trib now reports tbat the man died. Very good points. For larger dogs and known sometimes dangerous breeds this is a must. I actually discourage anyone, especially the terminally ignorant folks among us, from getting those types. If you can’t manage, train and control your animal perhaps you oughtn’t to have it. I will bet that when more news comes out the person who had these two dogs will claim they were docile and ‘usually’ contained; not really good enough for the two victims, is it? I find loose dogs often, with no ID. When I eventually find their lame humans I always ask about the ‘no collar, no ID’ thing. The fools always say their dogs never get out so don’t need them! Or they gave them a bath days ago and forgot to replace the necessary accessory. How can one contend with this sort of ignorance and stupidity? Humans need a lot of training. (2) totally innocent people were attacked and severely injured.Most likely without provocation.I feel so bad for the victims. Secondary, These dogs were obviously NOT securely confined. To leave the dog owners name unpublished is doing the victims a disservice. Please keep your pets confined for their OWN safety and human safety. Do not forget what has occured here. U hope these victims can make it past this horrible event.